Black Elegant Round Natural Obsidian Pendant Necklace Well with Long Extend Bead Chain for Mens or Womens. Perfect gift for yourself and people you love. Round Natural Obsidian Crystal Pendant Bead Necklace with Attractive pattern design,make you look more elegant. Suit for Mens and Womens. Obsidian is a nice crystal gemstone, anti-radiation, fatigue resistance , and bring positive energy to you , and benefit for health.Obisidian is a lucky stone according to a legend. 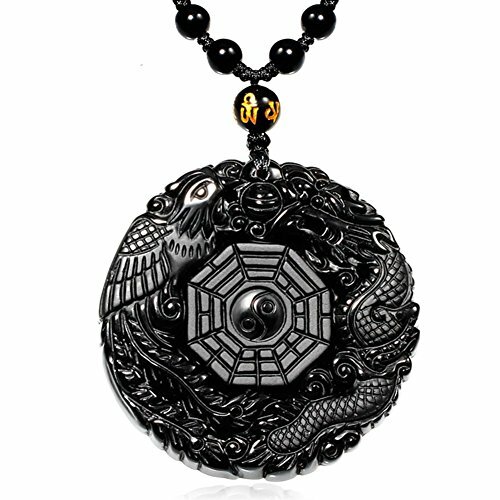 Pendant's Size: (Diameter) 1.97 inch x 0.39 inch (thickness); Necklace Length: 19.69 inch - 31.5 inch (Adjustable). Superb manual art-craft, strong and durable workmanship,highly hand polished ,wear comfortable. This pendant necklace is a great gift for Birthday, Father's festival, Mother's festival, Business gifts,Tourism souvenir ect. If you have any questions about this product by MOHICO, contact us by completing and submitting the form below. If you are looking for a specif part number, please include it with your message. COAI Raw Obsidian Dragonglass Arrowhead Pendant Long Necklace 31.5"